P0045 VNT Malfunction For the VNT. The VNT actuator has a malfunction. P0049 Turbo Charger Turbine Over speed The turbine rotation sensor has been detected. Over speed of the turbo has been detected. P0088 Common Rail Pressure -Too high High fuel pressure has been detected. P0093 Fuel System Leak Detected The pump does not work properly. (Fuel leak) There is a possibility of the fuel leakage. Perform the fuel leakage check. P0103 Mass Air Flow Sensor Malfunction (HI) The mass air flow sensor has a malfunction. There are possibilities of the sensor malfunction and short circuit to +B in the harness. P0108 Boost Pressure Sensor Malfunction (HI) The boost pressure cannot be detected properly. There are possibilities of the sensor malfunction and short circuit in the harness. P0117 Engine Coolant Temperature Sensor Malfunction (LO) The temperature cannot be detected properly. There are possibilities of the sensor malfunction and short circuit to ground in the harness. P0191 Rail Pressure Sensor Malfunction Characteristic malfunc- tion The rail pressure cannot be detected properly. There is a possibility of the sensor malfunction. P0192 Rail Pressure Sensor Malfunction (LO) The rail pressure cannot be detected properly. There are possibilities of the sensor malfunction and short circuit to ground in the harness. 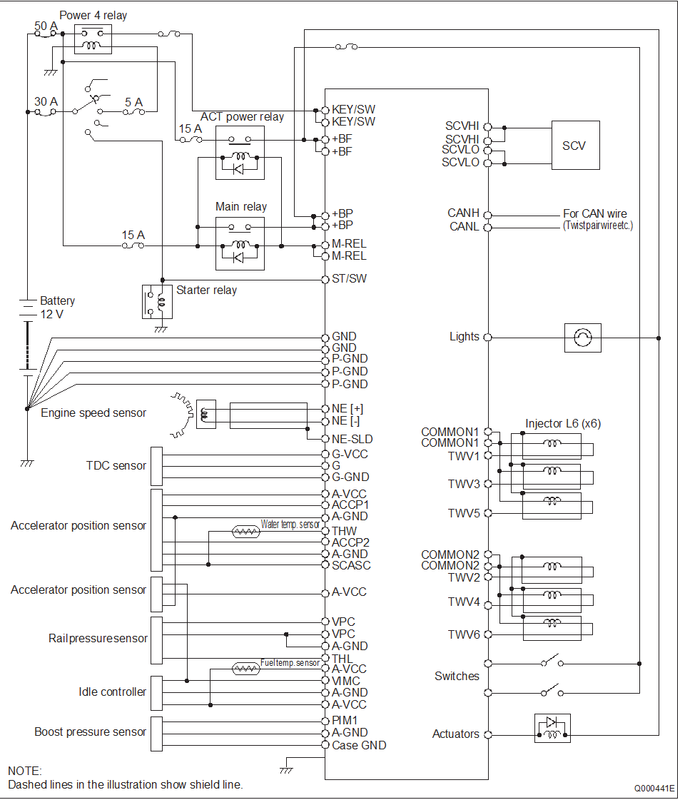 P0200 ECU Charge Circuit Malfunction (HI) The voltage for the injector activation is too high. Replace the ECU. P0201 Injector 1 Open Circuit There is a possibility of the Injector 1 malfunction or open circuit in the harness. P0202 Injector 2 Open Circuit There is a possibility of the Injector 2 malfunction or open circuit in the harness. P0203 Injector 3 Open Circuit There is a possibility of the Injector 3 malfunction or open circuit in the harness. P0204 Injector 4 Open Circuit There is a possibility of the Injector 4 malfunction or open circuit in the harness. P0205 Injector 5 Open Circuit There is a possibility of the Injector 5 malfunction or open circuit in the harness. P0206 Injector 6 Open Circuit There is a possibility of the Injector 6 malfunction or open circuit in the harness. P0217 Over Temperature Condition The over temperature condition has been detected. Check the cooling system. P0219 Engine Over speed Condition The engine speed exceeded the rated value. 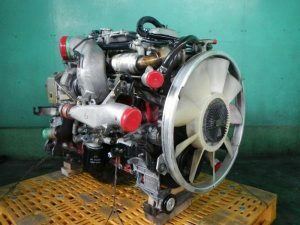 P0234 Turbo Charger Overboost Condition The boost pressure is too higher than the specified value. Boost Pressure Sensor Malfunction (LO) “The intake air pressure cannot be detected prop- erly. Correction Error Between Cylinders #1 The rotation fluctuation in the cylinder 1 became big- ger than other cylinders. There is a possibility that the flow damper is operat- ing. Correction Error Between Cylinders #2 The rotation fluctuation in the cylinder 2 became big- ger than other cylinders. Correction Error Between Cylinders #3 The rotation fluctuation in the cylinder 3 became big- ger than other cylinders. Correction Error Between Cylinders #4 The rotation fluctuation in the cylinder 4 became big- ger than other cylinders. Correction Error Between Cylinders #5 The rotation fluctuation in the cylinder 5 became big- ger than other cylinders. Correction Error Between Cylinders #6 The rotation fluctuation in the cylinder 6 became big- ger than other cylinders. Crankshaft Position Sensor Malfunction “In case that the NE and G sensor have malfunctions, this P code will be output.” The pulse from the crankshaft position sensor can- not be detected. There are possibilities of the sensor and harness malfunctions. Engine Speed Sensor Malfunction The pulse from the engine speed sensor cannot be detected. EGR Valve 1 Clogged Clogging has been detected by the lift sen- sor. The EGR valve 1 is clogged in the open state. P0405 EGR Lift Sensor 1 Malfunction (LO) “The EGR lift sensor 1 has a malfunction. P0406 EGR Lift Sensor 1 Malfunction (HI) The EGR lift sensor 1 has a malfunction. P0407 EGR Lift Sensor 2 Malfunction (LO) “The EGR lift sensor 2 has a malfunction. P0408 EGR Lift Sensor 2 Malfunction (HI) The EGR lift sensor 2 has a malfunction. P0490 EGR Solenoid Valve 1 Malfunction The EGR solenoid valve 1 has a malfunction. There are possibilities of the solenoid valve malfunc- tion and short circuit to +B in the harness. Open circuit The pulse from the vehicle speed sensor cannot be detected . Noise The pulse from the vehicle speed sensor has an error. P0510 Idle Switch Malfunction The idle switch does not function properly. Monitor the state and check the ON/OFF judgment. P0524 Engine Oil Pressure Too Low The engine oil pressure became too low. EGR Valve Clogged Clogging has been detected by the lift sensor. The EGR valve 2 system is clogged in the open state. P0540 Preheating System Malfunction The intake heater relay has a malfunction. There are possibilities of the relay and harness mal- functions. P0545 Exhaust Gas Tempera- ture Sensor 1 Malfunction (LO) The temperature cannot be detected properly. There are possibilities of the sensor malfunction and short circuit to ground in the harness. P0605 Flash ROM Malfunction There is an internal malfunction in the ECU. Replace the ECU. P0606 CPU Malfunction (Hard- ware Detected) There is an internal malfunction in the ECU. Replace the ECU. P0607 CPU Monitoring ID Malfunction There is an internal malfunction in the ECU. Replace the ECU. P0611 ECU Charge Circuit Malfunction The voltage for the injector activation is too low. Replace the ECU. P0617 Starter Switch Malfunction There is a short in the starter switch circuit. P0686 Main Relay Malfunction The main relay cannot be turned OFF. Check the relay. P0704 Clutch Switch Malfunction The clutch switch cannot be detected properly. Monitor the state and check the ON/OFF judgment. P0850 Neutral Switch Malfunction The neutral switch cannot be detected properly. Monitor the state and check the ON/OFF judgment. Accelerator Position Sensor for Operation (LO) The accelerator position sensor for operation cannot be detected properly. There are possibilities of open and short circuit to ground. P1133 Accelerator Position Sensor for Operation (HI) The accelerator position sensor for operation cannot be detected properly. There is a possibility of short circuit to +B. Idle Volume (LO) The idle volume cannot be detected properly. Check the sensor voltage. Idle Volume (HI) The idle volume cannot be detected properly. Check the sensor voltage. P1211 Injector Common 1 Malfunction There is a possibility of short circuit to ground. Check the injector and wiring. P1212 Injector Common 1 Malfunction There is a possibility of open or short circuit to +B. Check the injector and wiring. P1214 Injector Common 2 Malfunction There is a possibility of short circuit to ground. Check the injector and wiring. P1215 Injector Common 2 Malfunction There is a possibility of open or short circuit to +B. Check the injector and wiring. P1428 Exhaust Pressure Sensor Malfunction (HI) The exhaust pressure cannot be detected properly. There are possibilities of the sensor malfunction and short circuit to +B in the harness. The transmission retarder relay has a malfunction. There are possibilities of the relay malfunction and short circuit to +B in the harness. The cruise control retarder relay has a malfunction. There are possibilities of the relay malfunction and short circuit to +B in the harness. P1530 Engine Stop Switch Close Malfunction The engine stop switch has a malfunction or there is short circuit in the wiring. P1565 Cruise Control Switch Malfunction The cruise control switch has a malfunction and remains ON. P1601 QR Code Error The QR code has an error. Check the QR code. P1682 Exhaust Brake Solenoid Valve Malfunction The exhaust brake solenoid valve has a malfunction. There are possibilities of the solenoid valve malfunc- tion and short circuit to +B in the harness. P2002 DPR System Malfunction The DPR system has a malfunction. There are possibilities of the melt down and clog- ging. Perform the DPR system check. P2032 Exhaust Gas Tempera- ture Sensor 2 Malfunction (LO) The temperature cannot be detected properly. There are possibilities of the sensor malfunction and short circuit to ground in the harness. P2120 Accelerator Position Sensor 1&2 Malfunction Both the accelerator sensor 1 and 2 have malfunc- tions. There are possibilities of the sensor and har- ness malfunctions. P2121 Accelerator Position Sensor 1 Malfunction The accelerator position sensor 1 cannot be detected properly. Check the sensor voltage. P2122 Accelerator Position Sensor 1 Malfunction (LO) The accelerator position sensor 1 cannot be detected properly. Check the sensor voltage. P2123 Accelerator Position Sensor 1 Malfunction (HI) The accelerator position sensor 1 cannot be detected properly. Check the sensor voltage. There is a possibility of short circuit to +B. P2126 Accelerator Position Sensor 2 Malfunction The accelerator position sensor 2 cannot be detected properly. Check the sensor voltage. P2127 Accelerator Position Sensor 2 Malfunction (LO) The accelerator position sensor 2 cannot be detected properly. Check the sensor voltage. There are possibilities of open and short circuit to ground. P2128 Accelerator Position Sensor 2 Malfunction (HI) The accelerator position sensor 2 cannot be detected properly. Check the sensor voltage. There is possibility of short circuit to +B. U0073 CAN Communication Malfunction (Engine) For middle-sized VNT There is a malfunction of communication with the VNT. Communication with the transmission ECU is lost. U0104 Lost Communication (Cruise control) Communication with the auto cruise ECU is lost. U0121 Lost Communication (ABS) Communication with the ABS ECU is lost. U0132 Lost Communication (Air suspension) Communication with the air suspension ECU is lost. U0155 Lost Communication (Meter) Communication with the meter ECU is lost. U1001 CAN Communication error (Vehicle) CAN communication bus OFF judgment There is a malfunction of communication with other computers equipped in vehicle. TBD EGR Solenoid 1 Malfunction When linear solenoid specific P code is obtained “The EGR solenoid 1 has a malfunction. TBD EGR Solenoid 1 Malfunction When linear solenoid specific P code is obtained The EGR solenoid 1 has a malfunction. There are possibilities of solenoid valve malfunction and short circuit to +B in the harness. TBD EGR Solenoid 2 Malfunction When linear solenoid specific P code is obtained “The EGR solenoid 2 has a malfunction. TBD EGR Solenoid 2 Malfunction When linear solenoid specific P code is obtained The EGR solenoid 2 has a malfunction.